Located in Midtown, Hotel Pennsylvania is adjacent to Madison Square Garden and within a 10-minute walk of other popular attractions like Macy's. This 1705-room hotel has free breakfast along with conveniences like an indoor pool and a health club. Start your day off right with a free buffet breakfast, served each morning from 5:00 AM to noon. You can get a quick energy boost at the coffee shop/café. A TV comes with cable channels, and guests can stay connected with WiFi. The bathroom offers hair dryers and free toiletries. Other standard amenities include an ironing board and a desk. 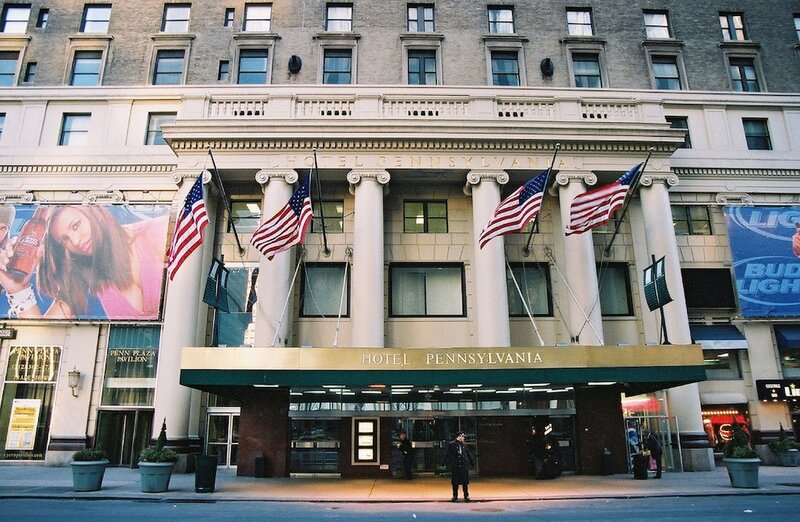 Guests of Hotel Pennsylvania have access to an indoor pool, a health club, and WiFi in public areas. Valet parking is available for USD 53 per day. Multilingual staff at the 24-hour front desk can assist with securing valuables, luggage storage, and tours or tickets. Additional amenities include a 24-hour business center, coffee/tea in a common area, and a computer station. Hotel Pennsylvania offers 1705 air-conditioned accommodations with hair dryers and irons/ironing boards. Televisions come with premium cable channels. Bathrooms include shower/tub combinations and complimentary toiletries. This New York hotel provides wireless Internet access for a surcharge. Housekeeping is provided daily. Statler's Grill - The classic New York steakhouse offers city views and serves breakfast, lunch, and dinner. City Perk - Independent coffee spot in lobby open 24 hours for beverages, snacks, pastries, desserts. Start your day with a free buffet breakfast, available daily from 5:00 AM to noon. Guests have access to the hotel's fitness center and are also able to use an adjacent sports club with indoor swimming pool. Central Park, one and one-half miles north, offers a variety of recreational opportunities, including ball fields, tennis courts, rowboat rentals, horseback riding, and miles of trails for hiking, biking, running, and in-line skating. Rockefeller Center's famed skating rink, 1 mile away, opens in winter, as does Central Park's Wollman Rink. A golf driving range is located at Chelsea Piers 1 mile west of the hotel. A resort fee is included in the total price displayed. The property has connecting/adjoining rooms, which are subject to availability and can be requested by contacting the property using the number on the booking confirmation. The property allows pets in specific rooms only and has other pet restrictions (surcharges apply and can be found in the Fees section). Guests can arrange to bring pets by contacting the property directly, using the contact information on the booking confirmation.